Vampires, vampires and MORE vampires! That’s what you’ll get when you tune in any or all of the following TV shows like The Originals, which just happens to be one of my favorite shows! I’m so depressed that they didn’t come back in the fall and we have to wait until 2017 to find out what’s happening. In the meantime, these shows will hold us all over! Grab the garlic, dust off the silver bullets and let the vampire watching begin! Bitten is actually about werewolves, which aren’t really all that different from vampires when you stop to think about it. Am I right? The show is based on a series of books known as Women of the Otherworld. In the U.S., Bitten debuted on Syfy in January 2014. It lasted for three seasons before it was canceled because of low ratings. Season one introduces you to Elena Michaels. She’s your average female werewolf in love with her human boyfriend. Elena wants a normal life. But, her werewolf obligations just keep getting in the way. In season two and three, you’ll learn all about a couple of witches and get the backstory on how poor Elena ended up with fur and fangs in the first place. The Vampire Diaries has a HUGE fanbase. Just like Bitten, it’s also based on a popular book series. (Google the author, L.J. Smith, to find out more.) When it premiered in 2009, the show was a total hit for The CW. It drew in the largest “debut audience” in the network’s history. When it comes to the supernatural, Mystic Falls is really a happening place. Just ask Elena Gilbert. Her parents recently died in a car accident. But, thankfully, she has her vampire boyfriend to help her get through it. It doesn’t get complicated until she also finds herself in love with her boyfriend’s older vampire brother who is trying to bring back his long-lost love who could be Elena’s twin. Are you confused yet? Tune in, to get the facts straight and to follow the other story lines that the 150+ episodes have to offer. Grimm is classified as an occult detective drama, which hit the airwaves in October 2011. Watch the series to meet homicide detective Nick Burkhardt. Nick is more than a little surprised to learn that he comes from the Grimms, guardians whose job it is to keep the peace between humans and the mythological beings from Wesen. Writers of many of the 123 episodes gleaned inspiration from the iconic “Grimm’s Fairy Tales.” The sixth and final season is slated to air in early 2017. I am so sad that it’s ending! If you love bloody vampire shows, True Blood is right up your alley. There’s no place like Bon Temps, Louisiana to meet a mysterious Southern gentleman vampire. And, that’s just what Sookie Stackhouse manages to do. If you’ve been searching for a sit-on-the-edge-of-your-seat vampire series that also covers contemporary topics such as drug addiction, equal rights, religion and the power of the media, you have to get to know Sookie and the rest of the town’s residents and visitors alike… many of which never make it out alive. Why wait for the fourth season of The Originals when you can get your vampire fix with any one of these scary TV shows? Remember, it doesn’t have to be Halloween to watch Dracula. He and hoards of other vampires lurk among the masses, regardless of the time of year! The bittersweet best part? A lot of these TV shows like The Originals have ended or are ending very soon, so you can binge away and not have to wait on new seasons to find out what’s going to happen. 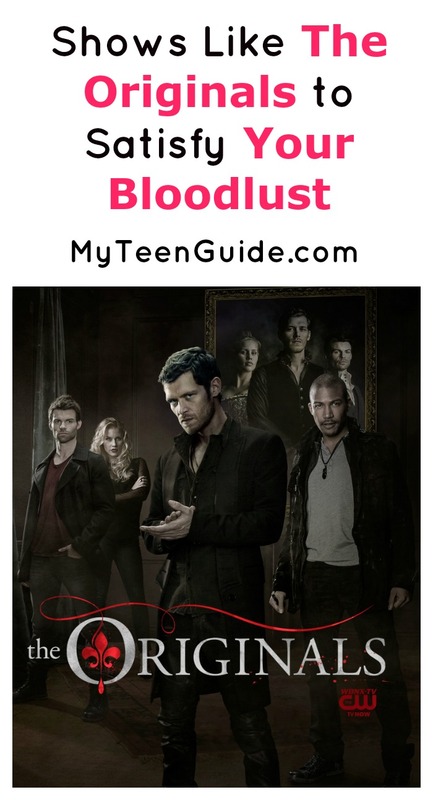 What are your favorite TV shows like the Originals? Share in the comments!